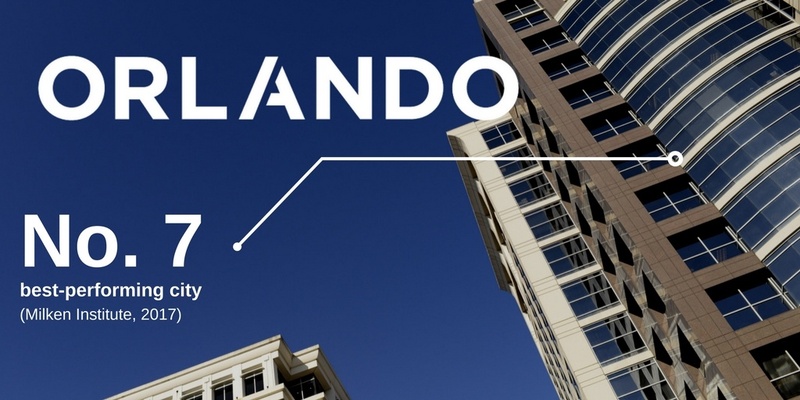 The Milken Institute recently ranked the Orlando metropolitan area seventh among large cities in the United States reflecting an improvement of two spots from last year. The region performed particularly well in the job and wage growth categories with employment rising by over four percent from 2015 to 2016 and wages surging by nearly eight percent from 2014 to 2015. This year’s performance marks the second consecutive top 10 ranking for the four-county area after tumbling from 11 in 2008 to 124 in 2012. Of particular note is the increasing importance of high-tech sectors in the region’s improved economic activity during the past five years. Regional partners in Brevard County earned special recognition for realizing the single greatest improvement over last year’s ranking, moving from 153 to the 63 position. Milken’s annual “Best-Performing Cities” assessment is an outcomes-based index, meaning it does not incorporate input measures business costs, cost-of-living components, and quality-of-life conditions such as commute times or crime rates. The Orlando Metropolitan Statistical Area (MSA) extends over 4,012 square miles and consists of four counties: Orange County, Seminole County, Lake County, and Osceola County. See the more detailed ranking here.